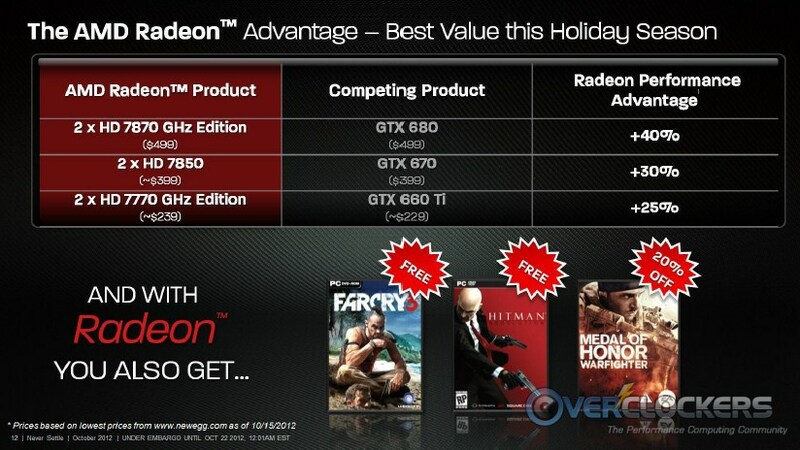 This holiday season, AMD is offering an enticing game bundle for prospective hardware purchasers. 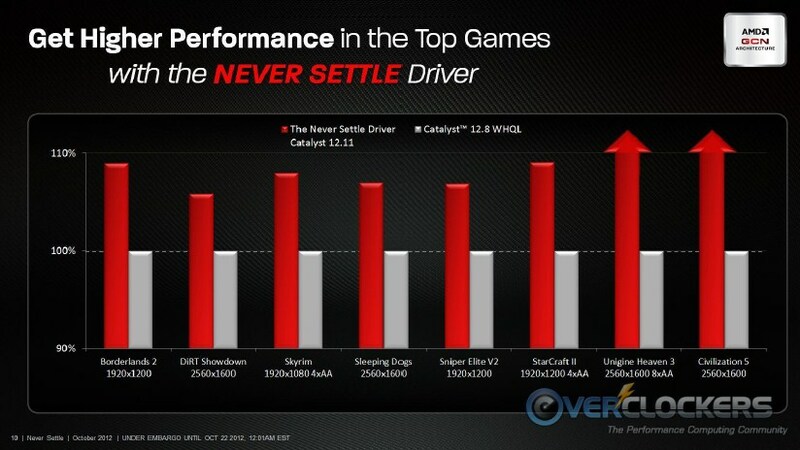 They’re also releasing their newest driver, which they say is the best Catalyst yet. Coinciding with the holidays this year is the release of three big titles – Medal of Honor: Warfighter, Hitman Absolution and Farcry 3. It’s these three titles plus the relatively new title, Sleeping Dogs, that AMD is bringing with their Never Settle bundle. 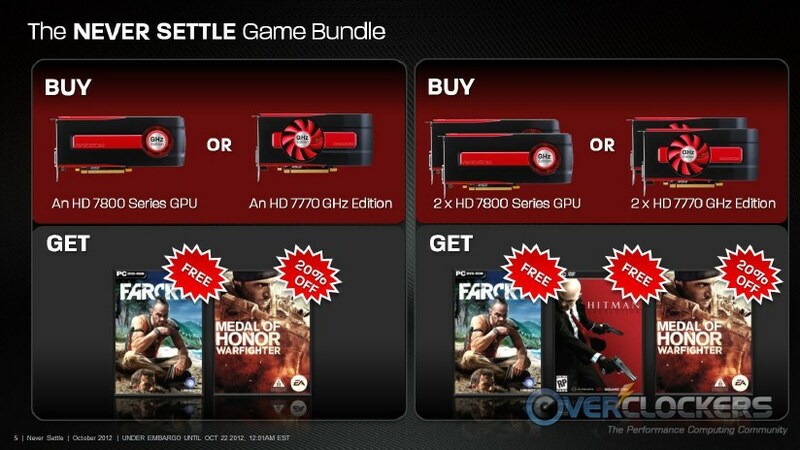 The biggest bundle offered is with 7900 series GPUs (the HD 7970 and HD 7950, plus their GHz editions). 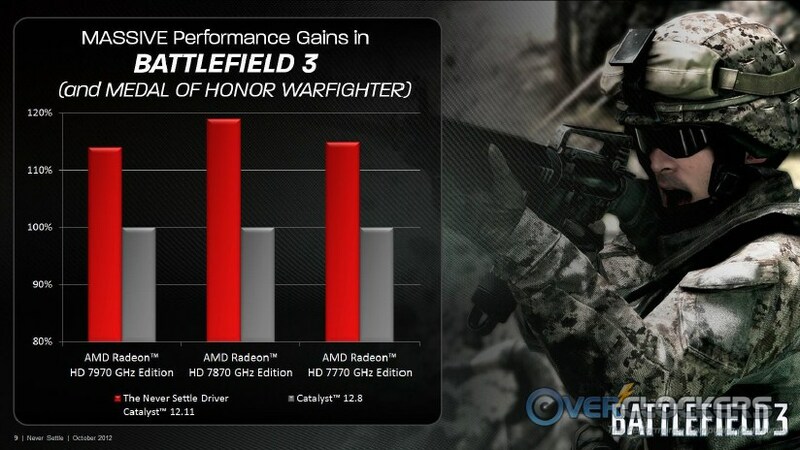 While Medal of Honor Warfighter isn’t a huge discount at 20% off, AMD says this is an exclusive deal and the only Medal of Honor: Warfighter deal anywhere. The biggest deal is that you get Sleeping Dogs, Farcry 3, and Hitman Absolution all free. Once you move down the AMD GPU spectrum, the offers remain but become a little slimmer. 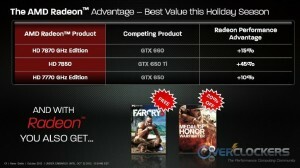 If you buy a single 7800 series or 7770 GHz Edition, you get the MoH deal plus free Farcry 3. 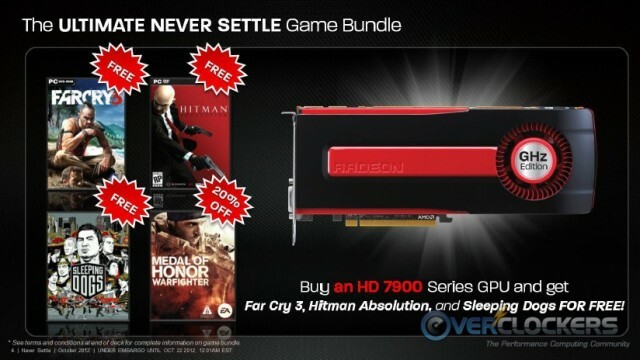 If you buy two of each of those, Hitman Absolution is added to the deal. As a monetary value (assuming full retail price for the games), this is actually a pretty sweet deal. 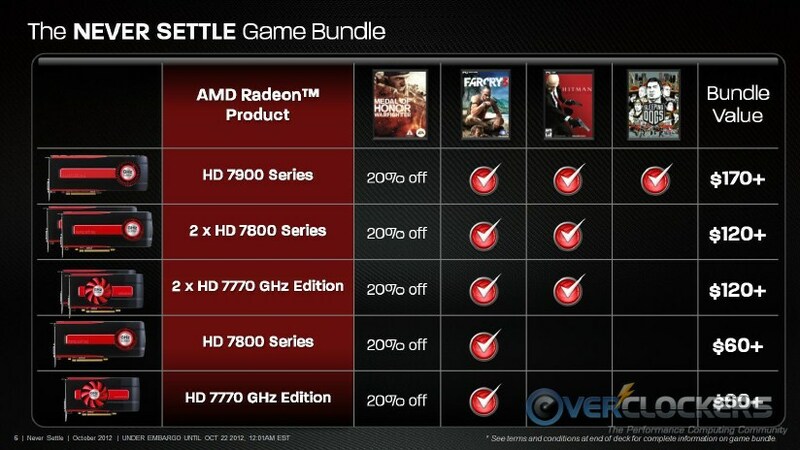 As far as distribution, these deals will be available on all applicable AMD graphics cards from all participating etailers. Yes, the vast majority of the GPUs to get this deal will be online purchases. Most cards are bought this way anyway, especially in our readership, so that’s fine by us. 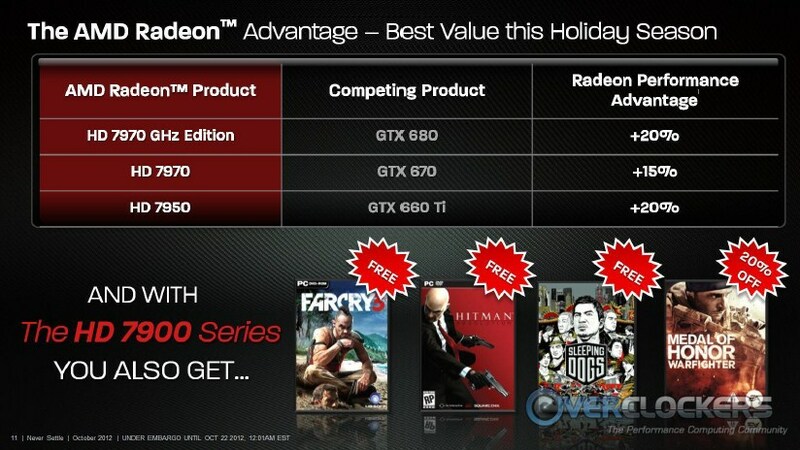 The method of distribution will be coupons placed in your GPU’s shipping box by your etailer. It should apply to all AMD GPUs in the program, regardless of manufacturer. You’ll get your GPUs, then you use the coupons and apply them at whichever software distributes that particular title (i.e. Steam & Origin). Free games aren’t the only thing starting today. 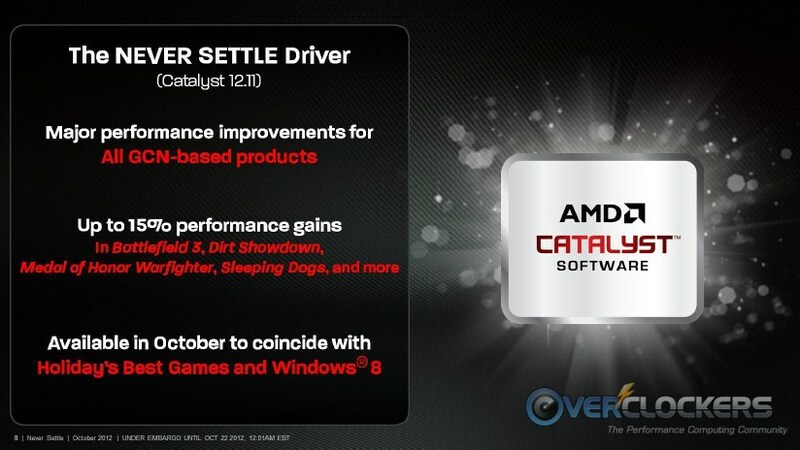 AMD’s newest Catalyst 12.11 driver is released today as well. They estimate up to 15% performance gains in many titles. The biggest performance increases actually come from Battlefield 3. On some maps in some locations, they say they have seen up to 40% FPS increase, 15% was just the average. BF3 isn’t the only title to reap the benefits of the new driver either. One important thing to note that was rather off-putting on this graph, is resolution. Note that AMD chose to present whatever the highest gain was, resolution independent. Note if you run a different resolution, the performance increase will not be the same and will likely be less. I understand why they might want to put their best foot forward, but that’s a bit extreme in my humble opinion. Performance Gains – Mind the Resolution! They’ve supplied a couple slides of value vs. the competition as well. For those of you skeptical as I am about such broad claims, here is the footnote showing how AMD came up with all of the numbers. There you have it folks, good news for AMD GPU fans all around. 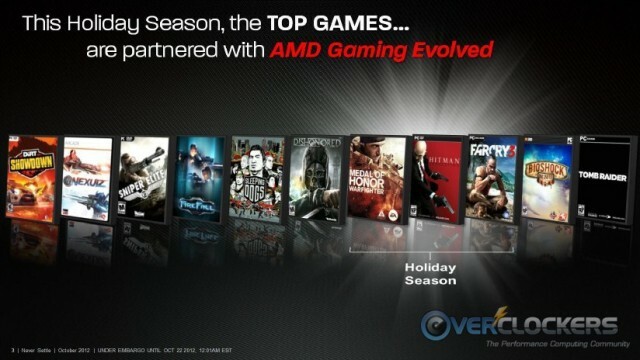 AMD hopes the news will bring some new AMD fans at the same time. 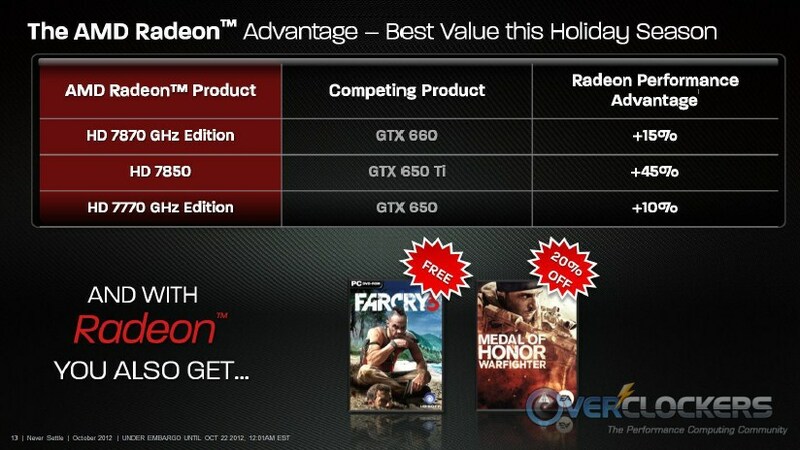 It’s a great game bundle if you’re interested in a new AMD GPU for the holidays. The driver improvements will make future and current AMD GPU owners happy. Does that deal apply all over the world? We are usually forgotten living all the way near the bottom of the Pacific Ocean. I think it will be buy card, get coupon and register on site to download free games so probably the same for all over the world ( depends from store where you buy it ). I was looking for these beta drivers but can't find them anywhere. Is 12.11 version already released or its just early info about what we can expect soon ? I read somewhere that 12.11 will be release Around 3PM EST today. But not quite sure how valid that is. EDIT - I'm not sure about the outside-the-US part. There doesn't appear to be anything in the terms & conditions, which I'll paste below in their entirety. It does say "void in any country where prohibited", which leads me to believe it's valid any any country that doesn't prohibit such things. 2012, after which the Game Keys and Discount Game Keys are void. LIMIT: One (1) free or discount Game Key per game per person. or www.amd.com/neversettlecrossfire for more information. Void in any country where prohibited. "At the request of AMD the driver has been taken offline. They discovered some bugs and a new build is due to be released later today. Please keep checking this post, once we have the new build we'll update the file-mirror and thus the download." Now, that's a nice bundle that might even make me consider replacing my 470s with a 7970. YeeHaww! This is great news for me. A video card is the very last thing I need to complete my very first "ever" build on my own. Have a few of the last items being dropped off today from newegg.....then after that.....a video card is all I need. Was looking at picking up a GTX670.....but pfft!...I could get a 7970 for cheaper , with 4 games and mop the floor with that GTX670. I'm not brand loyal to any of this stuff....and that new bundle is just to good to pass up! BTW.....i'll be stepping up from a AMD 4000+ system with a GTX260 ( I had a 7800GTX in it before).....I know huh? This is going to be amazing. This man speaks the truth. I finally got an SSD and I was expecting the system to be fast, but my god, this just blew my expectations out of the water. Think sites like newegg and tigerdirect will be advertising if they're participating retailers in this? Was about to pull the trigger on a 7970 at like 4AM this morning but then saw the news and decided to hold off til I know more. Because I want all 3 of those games. An SSD is what makes your friends say "Damn, that computer is fast...". Cool! But what about the overall score?